Children with apraxia of speech (CAS) often display slow progress during speech treatment, which includes difficulty acquiring, retaining and generalizing new skills. In August 2012, CASANA awarded a competitive research grant to Dr. Maria Grigos and Ms. Julie Case of the Department of Communicative Sciences and Disorders at New York University. Funds from this grant were used towards their study of speech motor learning in children with CAS and children with typically developing speech and language skills (TD). The aims of this research were to explore how children learn novel speech targets and maintain newly acquired skills. 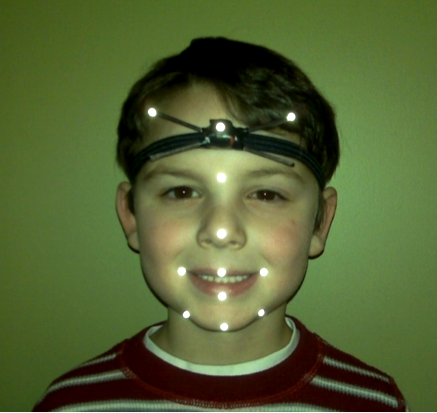 Facial tracking technology was used to investigate changes in speech production and articulatory control while children practiced novel words. Sixteen children between the ages of five and six years participated in the study: eight children with CAS and eight TD controls. Novel words were presented to the children at the beginning of the experiment. These words were produced at three different time periods: baseline, short-term, and long-term. Baseline represented the very first time children produced the novel words and was followed by an intense practice session designed according to principles of motor learning. Following this practice session, short-term change was measured. Children then returned three days later to assess long-term retention. These time periods were selected to capture speech production changes within a therapy session (i.e., short term change), as well as between sessions (i.e. long term retention). A three-day time period was selected to represent a typical lapse between therapy sessions. The children with CAS displayed short- and long-term improvements in consonant/vowel accuracy and consistency; however, their performance remained consistently poorer than the TD control group. Articulatory control was examined during accurate word productions. The children with CAS demonstrated longer duration of jaw movement than TD controls across each of the three time periods. Further, articulator movement variability remained high in the CAS group across all sessions, while children in the TD group produced more stable movements. In other words, children with CAS took more time to move their articulators and did so more variably than the TD controls as they produced novel words. The main finding from this research is that children with CAS showed improved consonant/vowel accuracy and consistency with practice, while their underlying movement patterns did not change. This result is particularly interesting as children with CAS often make slow progress in treatment and have difficulty generalizing treatment gains. During treatment, a child with CAS may improve sound production and appear to be making steady gains; however, increases in consonant/vowel accuracy alone may not reflect changes in the underlying movement patterns. Refined articulatory control may be required in order to maintain and generalize improved speech patterns. Additional work is needed to better understand the type and amount of practice required for long-term speech production changes to occur. Such research will contribute to our understanding of why certain treatment techniques are more effective for children with CAS than others. What is the difference between Speech Motor Planning, Programming, and Execution? By Anita van der Merwe, Ph.D. When a person decides to communicate verbally, the message first has to be converted from an abstract idea to meaningful linguistic (language) symbols. Syntactic, morphological, and phonological planning, occur. This linguistic-symbolic planning is a pre-motor (non-motor) phase. The language message must then be transformed into a code that can be handled by a motor (movement) system, such as the speech system. This transformation of the code occurs in three different phases. Speech motor planning, motor programming and execution are the three different phases in the preparation and the actual production of speech movements. Speech motor planning entails the formulation of the strategy of action by defining motor goals. Each speech sound has a core motor plan that contains a number of motor goals. Motor goals for speech production can be found in the spatial (place and manner of articulation) and temporal (timing) specifications of movements for speech sound production. For example, the motor plan for the /b/ sound includes lip closure, velar lifting and vocal fold closure as motor goals. These movements are adapted to the sound environment in which the sound is to be produced. The motor goals for /b/ in “book” versus /b/ in “big” differ in that the lips are rounded more when a person plans to produce the word “book”. During speech motor planning, the different motor goals for each speech sound are identified and arranged to occur concurrently and sequentially. Next, the strategy (motor plans) must be converted into motor programs (tactics). Motor plans are structure-specific while programs are muscle-specific. During motor programming muscle tone, movement velocity, force and range as well as mechanical stiffness of the joints are specified. The repeated initiation of muscle-specific programs is also controlled during programming. An analogy of the plan-program relationship is found in other movements of the body. When reaching out for an object the motor plan includes the forward movement of the arm, opening of the hand and closing of the hand. The amount of muscle tension in the arm and hand, as well as the velocity, force and range of the movements are specified during programming. Planning and programming of movement occur prior to the execution of movement. During the execution phase the plans and programs are transformed into actual movements. The different phases of motor planning, motor programming and execution are controlled by the coalition of various areas in the brain. A disorder in each of these phases may lead to different communication problems. The linguistic-symbolic planning phase is controlled by temporal-parietal areas and by Broca’s area. A disorder on this level may lead to aphasia. Motor planning is controlled by areas such as Broca’s area, the supplementary motor area (SMA) and areas 5 and 7 in the parietal lobes. A disorder on this level may lead to apraxia of speech in both its developmental and acquired form. Motor programming is controlled by areas such as the basal ganglia, the lateral cerebellum, the SMA and the fronto-limbic system. A disorder on this level may lead to certain components of dysarthric speech and possibly stuttering. Motor execution is controlled by areas such as the cerebellum, basal ganglia, motor cortex and the motor units in the muscles. A disorder on this level will lead to dysarthria. Childhood apraxia of speech may be the result of an inability to learn and control motor planning of speech. The child may be unable to learn the core motor plans for all the different speech sounds of the language, to recall the series of motor plans from the sensorimotor memory during continuous speech, to identify the different motor goals of each speech sound and to sequentially and concurrently organize the movements for each speech sound and a series of sounds. These underlying problems may result in the inability to produce some or most speech sounds, to produce utterances consisting of a string of sounds, to produce a certain combination of sounds and to produce sounds accurately in long or unfamiliar utterances. The child may also exhibit struggle behavior during speech production. Within the context of this theoretical framework, treatment of childhood apraxia of speech should address the underlying problems in the different components of speech motor planning.